Folks, they are making this newsletter too easy on me. That comment alone kills him, but I can’t resist a few swings of my own rhetorical baseball bat. 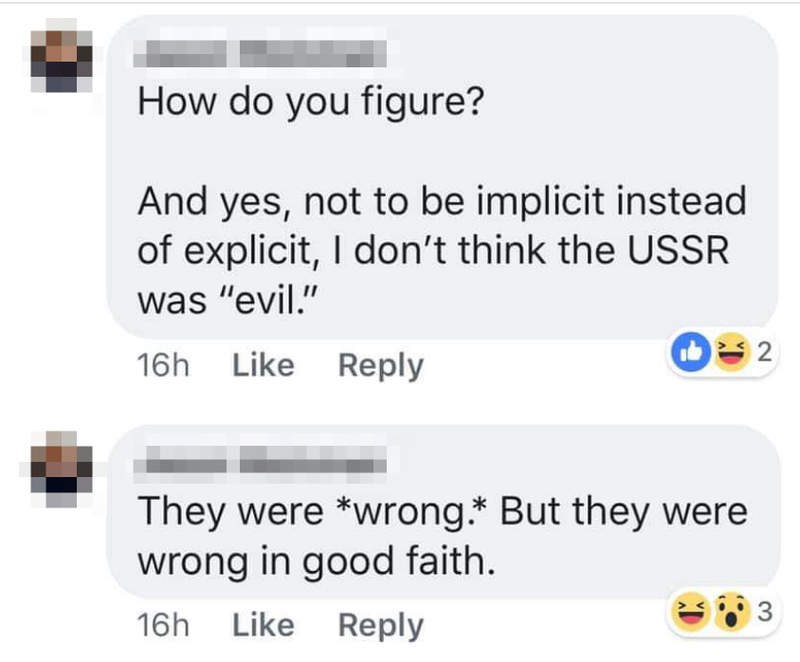 Our friend’s thesis: the USSR was not evil, but simply wrong in good faith. Now note: this same person considers your host here to be flat-out evil. Woods, says our friend, is evil. They just wanted to improve conditions for the working class, you see. Sure, they went about it the wrong way, but their motives were pure. Do you detect a slight — slight, I say — naivete there? The Bolshevik Revolution gave rise almost instantly to a one-party state with suppression of dissent, summary executions, concentration camps (with some 70,000 inmates by the time of Lenin’s death in early 1924), a concerted state campaign against religion, terror against the countryside — and on and on. Not to mention a secret police sixteen times as large as anything the Tsar had ever built. And that’s not to mention the far worse atrocities that came later. Hey, Ukrainians, we’re carrying out collectivization in a way that’s bound to starve millions of you to death, but honey, don’t you dare forget that our hearts are in the right place. Smooch! Read Harvest of Sorrow by Robert Conquest, and see what was done to those people. Then consider that an outspoken so-called libertarian, who accuses the whole world of fascism and “white supremacy” (a term that to my mind instantly discredits its user), thinks this was not an evil regime. This is the great moral exemplar who presumes to lecture the libertarian movement. He’s also known for dismissing and dissenting from the Nonaggression Principle. Gee, how surprising! Whose price theory, production theory, interest theory, business-cycle theory, and monetary theory did Rothbard hold and promote, if not the Austrian? Not to mention: Henry Hazlitt himself matter-of-factly described Rothbard as a member of the Austrian School, and one who in fact failed to appreciate his own significance. Hayek, too, said Rothbard was clearly working in the Austrian tradition, as did Mises. Meanwhile, the chairman of the Libertarian Party nitpicks your host’s every move, but do you think the claim that the USSR wasn’t evil, just misguided, will receive a rebuke? The question answers itself, my dear reader. Now I know that most libertarians would be rightly appalled by this person’s remarks, and that includes even (I trust) most people in the Libertarian Party. But it is this very kind of person who presumes to judge everyone else.